The protagonist of this story, Aichi Sendou, is a timid boy in his third year of middle school. He had been living his life looking backward rather than forward, trying not to stand out. However, he had one thing that kept him going—the "Blaster Blade," a card from a card game that was given to him when he was little. That card is the reason why he begins to engage in Card Fights, something that changes his life drastically. The name of the card game is "Vanguard." The game takes place at a different planet called "Cray," and due to a never-before-seen play system, it becomes popular throughout the world. Cardfight!! Vanguard has been published in English by Vertical Inc. since April 29, 2014. I'm just gonna get straight to this review, but please bear in mind I've never written a review before, and I've only read the first book. I just noticed that there weren't any reviews, and I wanted to write one because, frankly, this manga is amazing, especially for a card game-based one. Story: The story isn't your typical one for a card game manga, although it DOES seem like one at first glance. 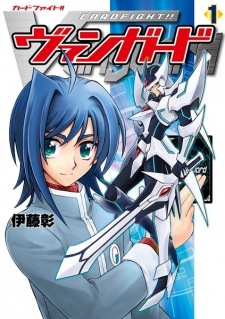 There's your shy, timid middle-schooler Aichi Sendou, and his favorite card, Blaster Blade. Then you have Kai Toshiki, whom is in High School and gave the card to Aichi when they were both younger. It seems Kai has changed a lot in the past few years, seeming how he was smiling back when he gave Aichi that card, and now he has a harsh, cold exterior... However, most card game mangas have some sort of evil villain seeking to destroy the world. That is not the case with CF! !V, Aichi is trying to develop into a braver, stronger person. The first book ends on a cliff-hanger (unfortunately), so I'm patiently waiting until I can afford the next book. Art: The art is rather well done. Blaster Blade's design is rather interesting, he seems like a knight, which makes sense, in context. He's from the Royal Paladin decks, after all. Kai runs a Kagero deck, which focuses on dragons- It makes you think, doesn't it? Knights, Dragons... Fairy tales, maybe? Characters: They're all wonderfully well-rounded, in my opinion. You can practically -sense- the tension between Aichi and Kai. There's also a woman who is at the card shop- who has a significantly... interesting ability. Other than one other character- someone younger than Aichi- most of the other character's are sorta just, there unfortunately. But what they do with the main characters is tremendously good. Enjoyment: Here's the fun part! I grew up with card games, like Pokemon's TCG and, of course, Yu-gi-oh!. I actually avoided CF! !V for a long while-- and I regret doing that. I always had a bit of interest in it- it was made by Yu-gi-oh and Magic's company as a collab at first, by Bushiroad. But I wasn't sure if I should read it, until my friends on tumblr and xat told me about it. I -had- to see what is was about. And it was amazing! I'm so glad I took the chance. Give it a try, please! I think anyone who's wanted to be braver will love it, and Aichi. Cardfight!! Vanguard promises an addicting take on the card fighting genre of anime. In a world where card fighting has become an essential of life let's take a closer look at the characters that drive this story—the card fighters that you can't help but love!